God of hope and restoration, draw near to those who offer compassion in times of immense struggle. Bless all church leaders with your strength and by your grace as we seek to support them through our gifts. Amen. Our mission co-worker has posted an update. Catch up with how God is at work in this part of our world. Remember the five year capital campaign that got the new building started? A biblical tithe (10%) was allocated for missions. You may have seen fences around a school in Haiti or read about the new heating boiler at Grandfather Home for Children (part of Children’s Hope Alliance) where our gift came just as the boiler collapsed, and other wonderful stories. Recently we received a letter and photos from Clayton Rascoe, Executive Director of Massanetta Springs Conference Center. The photos show two new sidewalks that make some important buildings more handicapped accessible and were a high priority for the center, but not an easy project for fundraising. I hope this message finds you doing well. First of all, this is a long overdue "Thank You!" from me personally. Your gift came in quite a while back, but since it was for sidewalks, we had to wait for the weather to be warm and dry enough here to get concrete work done. Between the temperatures and the rain, it took until mid-June for the work to be complete. By that point, we were in the midst of the summer, and time got away from me. My apologies. The sidewalk is phenomenal! Our mission is to be "a place for all people to experience God through renewal, discovery, and hospitality." Your gift which made the new entry sidewalk possible goes a long way to helping us be, "a place for all people." Now people with mobility challenges can access Richardson and the Historic Hotel on a smooth, level, easy to navigate sidewalk, instead of trying to negotiate the old bumpy asphalt one. It also helps our grounds appear more welcoming to guests. It is really a major upgrade for us. Thank you so much. I will send a more formal letter to the session soon, but I wanted to be sure this message, along with a couple of pictures reached you all without further delay. As always, if there are things we can do to help you in your ministry, please let me know. Thank you! Habitat for Humanity Volunteer day for CPC - May 20. Please mark your calendars now and go on the Habitat Forsyth volunteer website to register to spend a terrific Saturday with your CPC family building or renovating a house for a needy family. 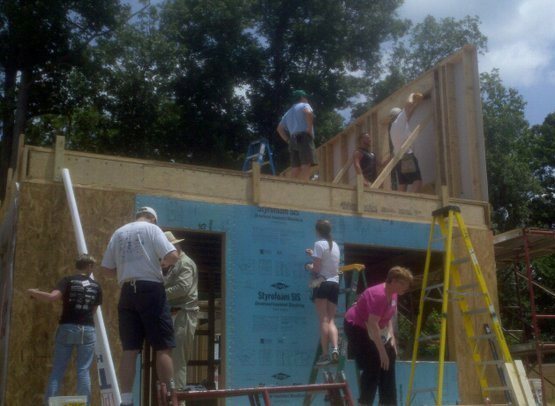 Habitat for Humanity is an international organization that helps provide safe and decent housing for families. Our own Bob Geyer was one of the first dozen people that started Habitat in Americus, Georgia in the 1970’s. 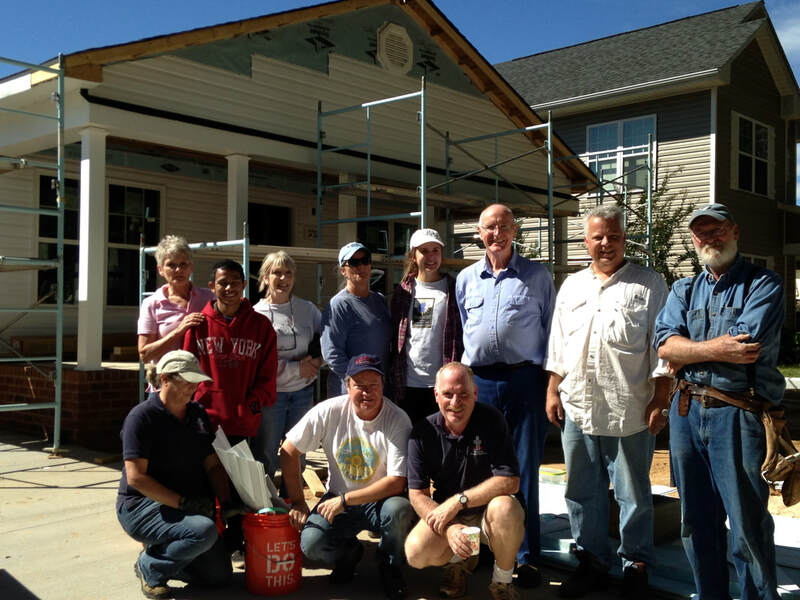 Now almost 10 million habitat homes have been built, mostly by volunteers, around the world. Habitat Forsyth has built 385 homes since 1985. Families must provide “sweat equity” by working on their own or another Habitat House. Families may then purchase the house with a no interest loan by participating in home ownership classes. What will we be doing? Painting, hammering, tearing out, caulking, raking, roofing, flooring? Over the years we have done all these things and more. It is surprising how much construction is really simple, or can be really simple. If you are not comfortable on the roof, stay on the ground. If you don't want to saw, there will be stuff to hammer, or move or paint or something. No one is ever asked to do anything they are uncomfortable doing. We really won’t know what we will be doing until the time we arrive because of the work completed by the volunteers the days and weeks before us. Whatever they have not finished doing will be our first tasks. Habitat provides all the tools you need, but has some suggestions on the volunteer website where you have to go to register. If you have questions, please contact Bill Hoyle or Kyle Shoffner. Please register before May 1 so Habitat won’t give our unfilled slots to someone else.